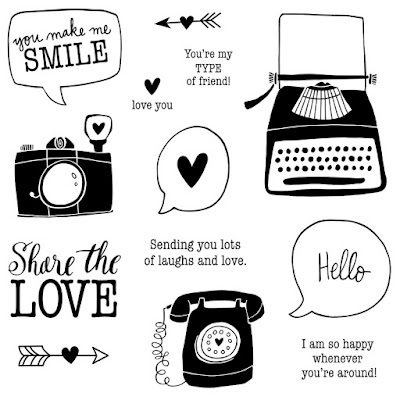 Welcome to our Blog Hop where we are featuring this adorable stamp set, "Share the Love". 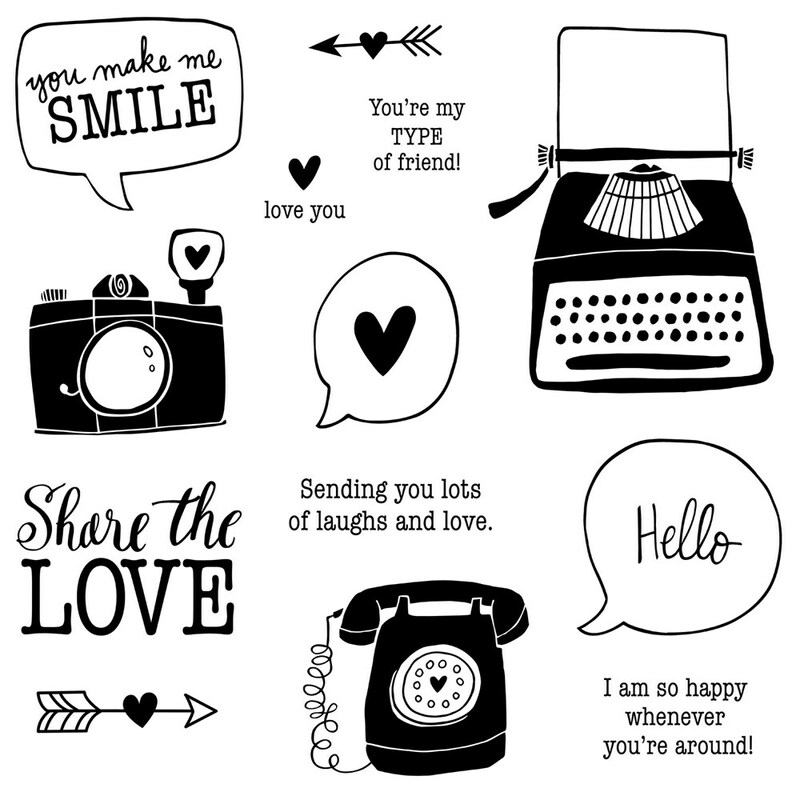 Did you know when you purchase this stamp set, $7 from your purchase will be donated to Operation Smile? That's right, it will! 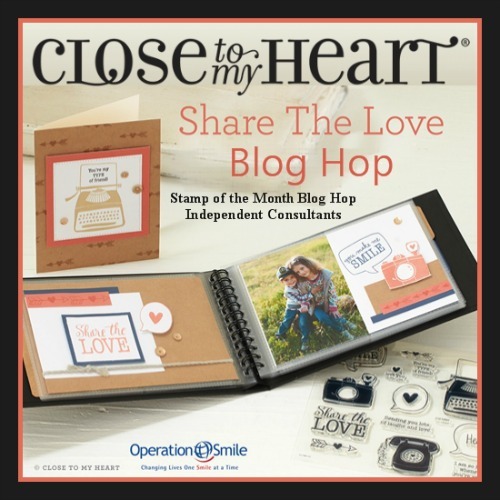 By ordering a stamp set this month you can have part in changing the life of a child. Read more details here. If you are coming from Catherine's Blog, you are headed in the right direction. You can find a complete list of participants by clicking on this link. So...let's get started, shall we? I had fun incorporating this bokeh background that is included in the Picture My Life My Story Scrapbooking Program. I created the "splatter" background using watercolor. I tapped the waterbrush over my finger to create the dots. Cool, huh?! I did stamp the typewriter image three times - once directly on the background piece, then in Glacier ink and lastly on White Daisy. I fussy cut the Glacier image to create the colored typewriter and then 3-D the sentiment piece, just for dimension. The sentiment is stamped in Lagoon and I added a Gold Puffie Heart. The White & Gold Ribbon was just the finishing touch. Now, go check out what Melinda has up her sleeve for this fun stamp set! I appreciate you stopping by. Oh love your card with the fun bokeh background! Thank you! I do love fussy-cutting and paper-piecing for certain images. That splatter goes so well with the background! Great colors! 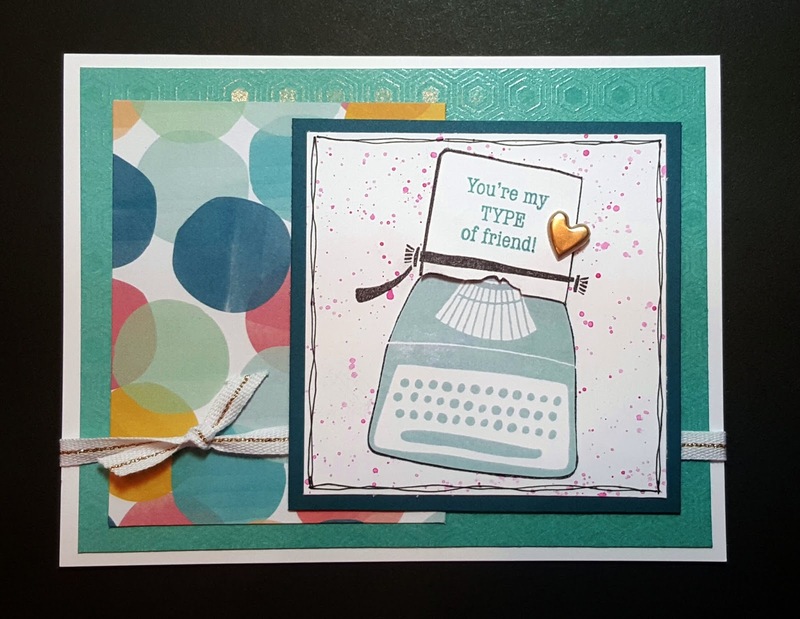 I love how you paper pieced the typewriter and added the gold heart. Thanks for sharing this wonderful card in the Share the Love blog hop. Appreciate your compliment, Marie! It was fun to make! I love those puffies! Great card. I love how you echoed the dots from the PML card on the background of your stamped image. Thanks, Brenda. It kind of magically worked that way as it came together. Very cute! I love the bright color circle PML card and your splatters. The layered typewriter is very cool! Thanks for saying so, Haley!